Denise: Set in Atlanta, Georgia, Media focuses on the Jones family, who owns and operates JUMP, a dynasty that has dominated the national, urban media scene for years. Between affairs and conspiracies, backdoor deals, fierce rivalries and even murder, the Jones family is doing everything they can to stop anyone or anything trying to tear them apart. This is none other than media mogul, Cathy Hughes’s passion project. In it, I’m honored to portray Danielle Jones, who is married to Brian White’s character, Michael Jones. We are described as the perfect “power couple”…that is, until his plans of leaving the Atlanta prosecutor’s office, to run for mayor are derailed when his Mom (Penny Johnson Jerald as Jackie Jones) asks him to run the family empire. Don’t let Danielle’s “supportive wifey” act fool you, as she’s making professional moves of her own and is currently under consideration for partner at the law firm. Stay tuned! The series will be coming at you later this year! Denise: Every project offers its own, unique take away. Whether it be thanks to the cast, crew, and/or subject matter. That said, I’d have to say that Tyler Perry’s still got the title. Just being on the set of Why Did I Get Married and welcomed to create alongside celebs whose work I’d admired, even before shifting gears into acting, was truly surreal. As for Meet the Browns…no one forgets their first series. The cast is still thriving and very close to this day, and the fact that’s it’s still syndicated is a testament to its “FANdemonium” and appeal. Dance Mogul: What inspired your cooking show and cook book? 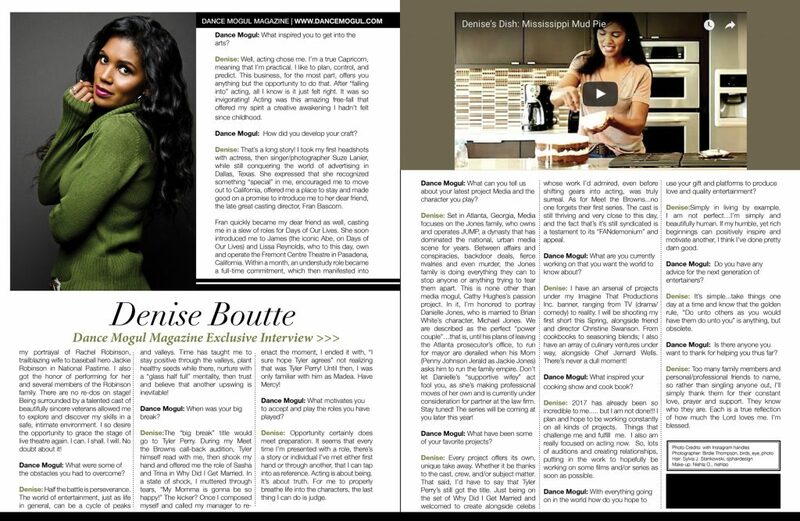 Denise: Cooking is a part of my DNA! I grew up just a bike ride away from my grandparents’ farm and that simplistic survival was centered on family, food and fun. You can celebrate, you can mourn, you can connect, it doesn’t matter…food will always be the common denominator. Denise: Too many family members and personal/professional friends to name, so rather than singling anyone out, I’ll simply thank them for their constant love, prayer and support. They know who they are. Each is a true reflection of how much the Lord loves me. I’m blessed.